‘Tis the Season | Who Killed Orrin Grey? Since it’s become a cliche by now, I’ll try to refrain from opening this post with an apology directed at the Internet in general for my long absences of late. Suffice to say that I’ve been incredibly busy of late, and that sadly shows no signs of abating, at least through the beginning of the new year. But I’m on the downward slope of a four-day weekend from the day job, and that’s allowed me to finally get around to getting some pictures taken/uploaded that I’ve been promising for a while now. So, in the spirit of seasonal festivity, here they are. He’s a Hellboy Skelanimal, one of a limited batch they made for comic-con. He’s on my top shelf, next to one of my Maltese Owl bookends (not their official name, I just found them in an antique store and they remind me of the Maltese Falcon) and my author copies of all the books I’ve ever been in. On one of my other shelves is this guy, who I just got from my good friends Reyna and Gavin Sparby. 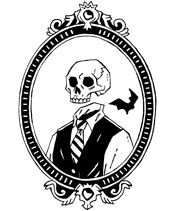 I’ve never read the comic he’s apparently from, but he’s a skeleton in a bow tie, so I immediately approve. He’s standing in front of my Fritz Leiber and Edgar Rice Burroughs books, which is a pretty good spot to be in. I hope you all have a happy whatever, and I’ll have more updates coming soon!